Theatre Royal Bury St Edmunds is delighted to present details of the fabulous new spring season line-up. In 2019 Theatre Royal celebrates its 200th Anniversary and there’s plenty of great shows on offer for theatre lovers of all ages. Opening the season in January will be the premiere of The Wisdom Club, a bold new Theatre Royal production by Danusia Iwaszko (writer of 2015’s A Labour of Love) directed by acclaimed Theatre Director Roger Haines (Calendar Girls, The Go-Between). An honest, contemporary exploration of Britain’s aging population, the story follows the lives of three friends on their journey to step out of the shadows, forget girl power this is Grey power! (Wed 30 Jan – Sat 9 Feb). Later in the season, Theatre Royal Bury St Edmunds’ Young Company will perform The Wind in the Willows, Alan Bennett’s delightful and witty adaptation of Kenneth Grahame’s classic children’s story. When Mole first steps out onto the riverbank he encounters a medley of woodland creatures, join them all as the infamous Toad of Toad Hall whisks everyone off on a madcap adventure! (Thu 18 – Sat 20 Apr). There’s plenty of drama with Out Of Joint presenting plays from two renowned authors, Andrea Dunbar’s semi-autobiographical play Rita, Sue and Bob, Too – told with wicked humour, startling insight and a great ear for dialogue and 2017 Nobel Prize winner Kazuo Ishiguro’s The Remains of the Day – a story for anyone who has ever been afraid to follow their heart. Northern Broadsides return with a production of William Shakespeare’s Much Ado About Nothing – transposed to the second world war in true Northern Broadsides style. There will be a production of The Trials of Oscar Wilde, using the original words spoken in court, Kevin Tomlinson and Abi Hodd of Kepow! Theatre are back with their new play about humanity Seven Ages and LAMDA will also return with a pair of new productions: She Stoops to Conquer by Oliver Goldsmith and The Cherry Orchard – Anton Chekov’s last and greatest play. Laughter is guaranteed with all the comedy coming up, Julian Clary will join us with his latest show – Born To Mince and Ardal O’Hanlon will be riding fearlessly into the culture wars with his world-acclaimed stand-up. Mark Thomas will examine the NHS in his funny, raw and angry style in Check Up – Our NHS @ 70 and Miles Jupp will star in The Life I Lead, a new comedy based on the life of David Tomlinson, best known for playing Mr Banks in Disney’s Mary Poppins. Showstopper! The Improvised Musical returns, with two performances meaning two entirely different brand-new-never-before-seen shows, and the riotous comedy duo LipService present a whistle-stop tour of train-related crime fiction with Strangers On A Trainset. John Godber’s international smash hit contemporary comedy Bouncers tells the sordid and hilarious tales of a Yorkshire nightclub, Apollo Theatre Company pay tribute to another radio comedy classic on stage with Hancock’s Half Hour and the Edinburgh Fringe’s favourite housewife presents a show about chance and luck – Barbara Nice: Raffle. Lovers of music have lots to look forward to with tributes to big name musicians like Buddy Holly & The Cricketers in a show of the same name, Karen Carpenter in Voice Of The Heart, Barbara Streisand in Streisand, Frankie Valli & The Four Seasons in Big Girls Don’t Cry and Barry Manilow in Manilow. There will be live performances from Lee Mead – star of Joseph in the West End; Brit Award-winning vocal trio Blake; and finalists of ITV’s The Voice UK, Belle Voci. Not forgetting the fabulous themed compilation shows: Rock and Pop music in Rock For Heroes; Country and Rock ‘n’ Roll classics in Forever In Blue Jeans; Themes from recent hit films in Sunday Night at the Movies performed by The Bury St Edmunds Concert Band; and songs of yesteryear with Old Time Music Hall featuring The Berkeley Squares. Once again we have plenty for dance aficionados, Ballet Theatre UK present Swan Lake, Ballet Central will present their 2019 showcase, Ballet Cymru are back with Romeo & Juliet and following 2018’s sell-out performance at Theatre Royal, another chance to see Rhythm of the Dance – a dance and music extravaganza containing a wealth of Irish talent. Psychic Sally returns with her 10 year anniversary tour, the popular Golf Day fundraiser is back, also as fundraisers: humanitarian and author Terry Waite, CBE will talk to one of British media’s most respected war correspondents Martin Bell, OBE; and Irving Stage Co will provide a night to remember at their Cabaret Supper. As ever, Theatre Royal is proud to play host to local companies: BSEAODS are back with their productions of Rodgers & Hammerstein’s The Sound of Music and Noël Coward’s Blithe Spirit; Irving Stage Company take on Benny Anderson and Bjorn Ulvaeus’ brilliantly powerful Chess: The Musical; Bury Theatre Workshop present their production of The Importance of Being Earnest, by Oscar Wilde; Hazelwood Dance Studios mark the school’s 27th year with The Hazelwood Show 2019; and All-Through Academy Trust will showcase their students work with Trust in Performance Drama Festival. Families are in for a treat with plenty of fun coming to the stage: Stuff & Nonsense Theatre Company presents The Gingerbread Man, Immersion Theatre return with The Amazing Adventures of Pinocchio, Full House are back with Jack and the Beanstalk, zany children’s book Aliens Love Underpants comes to the stage for the first time, Big Window & AJTC Theatre present a hilarious, poignant new play If All The World Were Paper, Tall Stories return with The Gruffalo and MEI Theatrical Ltd present The Very Hungry Caterpillar Show – four of Eric Carle’s classic books from the page to the stage. Booking multiple shows this season with the Season Saver discount will make you big savings, the more you see, the more you save! Booking 4+ shows will save you 10%, 6+ shows 15% and 8+ shows a massive 25% off! Book early to secure your favourite seats at the best possible price. Tickets go on general sale on Sat 27 Oct at 10am. There is a 7 day pre-sale period for Theatre Royal members starting Sat 20 Oct at 10am, Friends Memberships start at £47 per year and in addition to accessing the presale you’ll make savings on tickets. 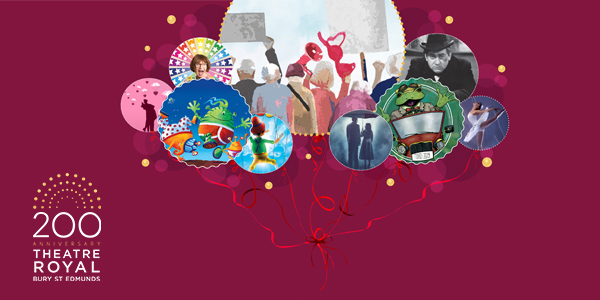 The full programme for this special year is still to be announced but it will include a feast of exciting new productions, some fabulous celebrity guests, a new exhibition space, a range of tours and talks, and creative arts projects in schools and the community to bring the theatre’s fascinating 200 year story to life. Make sure you are always up to date with what’s going on by signing up to our mailing list.